Stress. It’s a word we hear far too often, but know all too well. Just about everyone experiences it at some point, both internally and externally. Stress on the body, whether it be from spending days on the computer, in cars and planes, can wreak havoc on our health. We don’t put enough importance on the necessity of downtime, but if we did, we may find ourselves happier and less stressed. Much of the tension we store occurs in our muscles, one of them being the psoas muscle. This can result in an ugly downward spiral that becomes a source of anxiety and stress in and of itself. The psoas muscle is the largest muscle in our bodies, running through the entirety of our trunk. 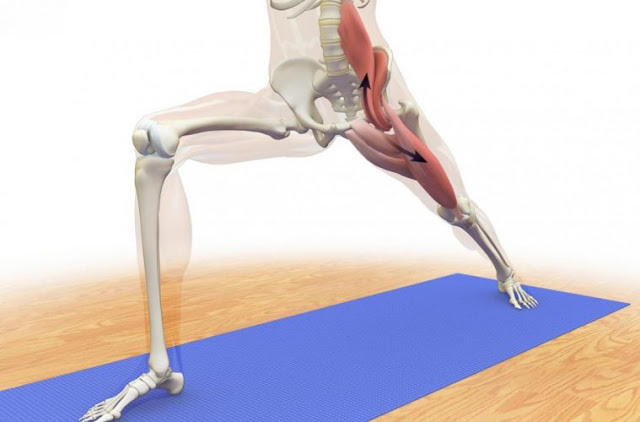 Also called the “muscle of the soul,” stretching the psoas muscle does more than just release tension. This muscle is where we often store stress or trauma that can influence our mood and perspective on life. Built-up stress can biologically manipulate our well being, and even advertisers and politicians take advantage of it to brainwash humans. Called the “lizard brain,” it is the oldest part of the brain, the brain stem, that is responsible for primitive survival instincts like aggression and fear (“flight or fight”). If we store negativity, like fear, we cannot think clearly, as fear has the ability to shift our lifestyles, even control them. That’s why it’s so important we become aware of where fear is stored and how to release it. The psoas muscle stretches from the lower trunk through the hips and into the top of the thighs, and is used for core stability and the fight flight reflex. When we see something that creates fear in us, our brain sends signals to the body to respond by releasing adrenaline. When we don’t respond, this stress hormone gets stored up in the body and can result in such health problems as insomnia, lowered immune system, anxiety, eating disorders, depression, and living in a constant state of fear or alert. Because stress builds up on an unconscious level, it is primitive that we consciously heal our bodies. And while there is no single way to do this, there is a gradual way, which includes lifestyle changes and a daily practice. Craniosacral Therapy, for instance, works to teach the body how to relax into a parasympathetic state that puts the nervous system at ease. The therapy is a gentle and non-invasive method for teaching us awareness of what our bodies need, and therefore eliminate stress that’s stored within us. “Through subtle touch, the therapist reads the ‘story’ of your body, locating tensions and using its physiology as a guide to healing. It responds to this sensitive touch by beginning to listen to itself. This deep connection enables it to initiate the pace of each treatment and the form of its own healing,” explains Shine Holistic. A huge part of taking on a healthier lifestyle is commitment to daily practice that continuously works to heal, replenish, and relax you. A variety of yoga poses, for instance, can help you to release this stress, anxiety, and fear that gets built up within the psoas muscle. Take a look at Yoga International’s long and detailed list of photos and descriptions of poses that can get you started. There is not enough urgency in everyday society regarding the link between the physical and the mental worlds of our bodies. But if we saw them as intertwined as they are, we would pay much closer attention to how one affects the other. Stretching your psoas every day will work to loosen your mind from the hold fear and anxiety can have on your wellbeing.